Arecibo posted the first win in Group D action as they rallied past Libertadores on Saturday. Andre Emmett (196-F-82, college: Texas Tech) recorded 30 points to lead the charge. Arecibo established a 51:36 halftime lead. They protected it well throughout the second half and marched to the victory. 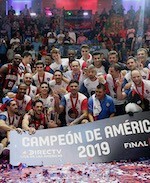 Elijah Holman (208-F/C-89, college: Detroit Mercy, agency: Pensack Sports) produced 23 points for the Puerto Rican team. Cezar Guerrero (185-G-92, college: Fresno St., agency: Best of You Sports) replied with 20 points for Libertadores. Guaros earned the second straight win in Ponce as they beat the hosts. Aaron Harper (203-SF-81, college: Mississippi) delivered 23 points for the Venezuelan side. Guaros secured a 40:32 halftime lead. They used a 23:11 run in the third term to clear off for good. Rodney Green (196-G/F-88, college: La Salle) chipped in 17 points for the winners. Carlos Arroyo (188-PG-79, college: FIU, agency: Interperformances) answered with 23 points and 7 assists for Ponce.